In August 1821, a group of people from Rurutu in the Austral Islands, in the south-eastern Pacific Ocean, traveled north to the island of Ra’iatea in the Society Islands, to a London Missionary Society station. There, they presented to the missionaries a number of carved figures that represented their gods, as a symbol of their acceptance of Christianity. The population of Rurutu had all converted to Christianity in obedience to a decision made by their highest leaders. This figure was among those presented, and is described by one of the missionaries at the time, John Williams. It was taken into the London Missionary Society collections, brought to London in 1822, and subsequently sold to The British Museum in 1911. 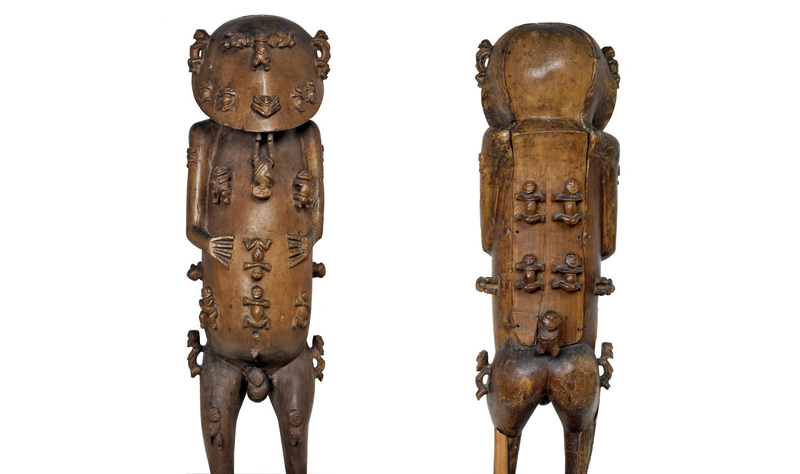 There is debate about which of the Rurutu gods this figure represents. John Williams identifies it as A’a. The god is depicted in the process of creating other gods and men: his creations cover the surface of his body as thirty small figures. The figure itself is hollow; a removable panel on its back reveals a cavity which originally contained twenty-four small figures. These were removed and destroyed in 1882. Contemporary Rurutuans explain that the exterior figures correspond to the kinship groups that make up their society, and propose a number of theories about the relationship between the figure and Christianity. 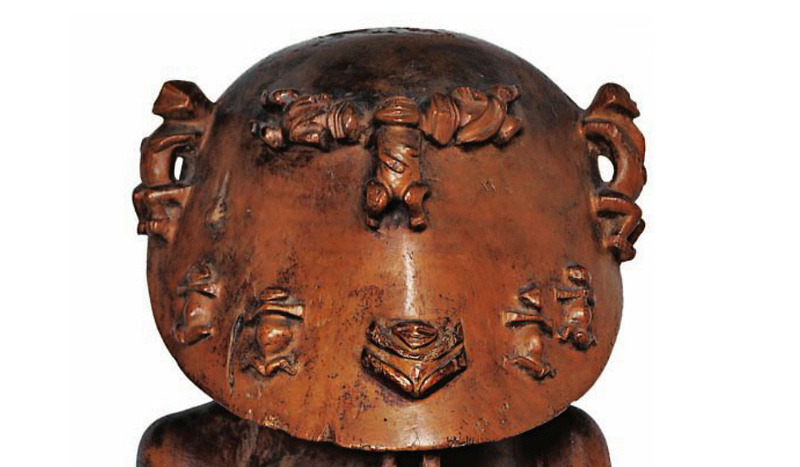 It is carved from hardwood, probably from pua (Fagraea). A hollow toad shape, faced with a blank shield. Which is inserted through a hole behind. His smooth wood creeps with all the creeds of the world. And dissolve into our judgement all their codes. Let us stand here and admit that we have no road. And grant his reign over the entire building. J. Harding, “A Polynesian god and the missionaries,” Tribal Arts (Winter 1994), pp. 27-32. A. Gell, Art and Agency: An Anthropological Theory (Oxford, Clarendon Press, 1998). W.B. Fagg, Tribal Image: Wooden Figure Sculpture of the World (London, The British Museum Press, 1970). Cite this page as: The British Museum, "Rurutu figure known as A’a," in Smarthistory, March 2, 2017, accessed April 19, 2019, https://smarthistory.org/rurutu-figure-known-as-aa/.